Departure times and prices vary from time to time. Therefore see the KTEL LEFKADAS interrnet site, for the exact dates. You may even do your online ticket purchasing there. The K.T.E.L. Bus Office is located in the Tzeveleki Street, Lefkas, +30 26450 22364. The drive from Lefkas to Vasiliki takes about 1 hour. For more information about our departures you can visit our ticket office in Nidri situated in the center of Nidri (main st. 107) operating Mon to Sun 09.30-14.00 and 18.00-21.30. The local bus operator owns 28 buses and serves the entire island. The drive to Vasiliki takes about 1 hour. This is the bus line from and to Preveza Airport. 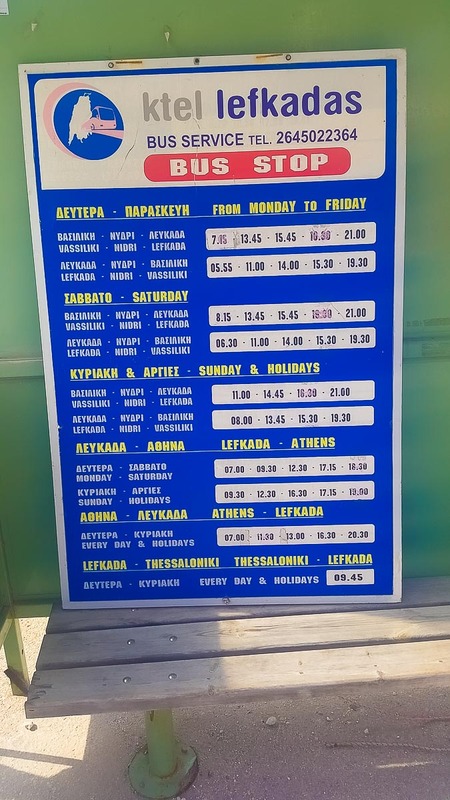 The bus to Lefkada stops about 10 minutes after the departure time in Preveza city. The bus from Lefkada stops about 30 minutes after the departure time in Lefkada Town. Take the bus X93 to Kifisou avenue (KTEL Kifisou) at the Airport Athen (ATH) . The bus station is located between Exit 4 und 5 at the airport arrivals level. You have to book a seat in advance here Online! Special departures can be arranged for group of people wishing to travel any other time during the day.